"The noise was fantastic. A huge trumpeting roar set off all the car alarms. The hairs on the back of my neck stood on end. Everyone stood still and waited until it appeared - I fell in love and I knew I would never forget my first Vulcan display". Few aircraft evoke such strong emotions with the public as Avro Vulcan XH558, the darling of the airshow circuit - The Loved One. Roaring into the sky with black smoke pouring from its thundering Olympus engines, the Vulcan can bring airshow spectators to a complete standstill. The sight and sound of its display is an emotional and unforgettable experience for those who witness it. 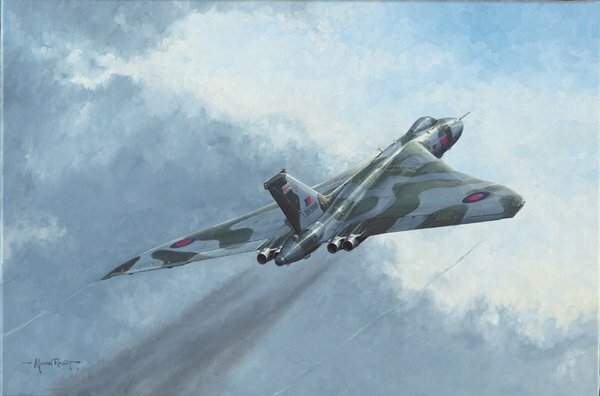 This portrayal of XH558 during its display is a must-have for Vulcan enthusiasts.